Ohio has had a cold and wet spring. An extended heating season with reduced opportunities for natural ventilation increases the chances of crop damage by ethylene. On a recent visit to greenhouses in northwest Ohio we observed plants that had symptoms of ethylene damage. Plants were stunted, with delayed flowering. New Guinea baskets had distorted growth with curling of the leaf margins. Petunias also had distorted, curled leaves that were smaller than normal. Tomatoes growing in the same greenhouse showed downward curvature of the petioles, referred to as epinasty. Epinasty is a classic symptom of ethylene damage. Tomatoes are one of the most ethylene sensitive crops, and they are often used as an indicator plant to diagnose ethylene damage. The severity of ethylene damage varies among tomato varieties. We saw epinasty on ‘Mountain Spring’ and ‘Early Girl’ but little damage on ‘Champion II’ tomatoes. 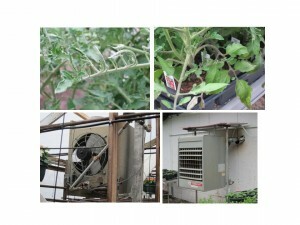 The backup heater that was running in this greenhouse was not vented, releasing harmful byproducts of combustion, including ethylene, into the production environment. Low levels of ethylene (even in the ppb range) can be very damaging to young plants, delaying normal growth and development. The best way to avoid ethylene damage this time of year is to make sure that your heaters are running efficiently and properly vented. 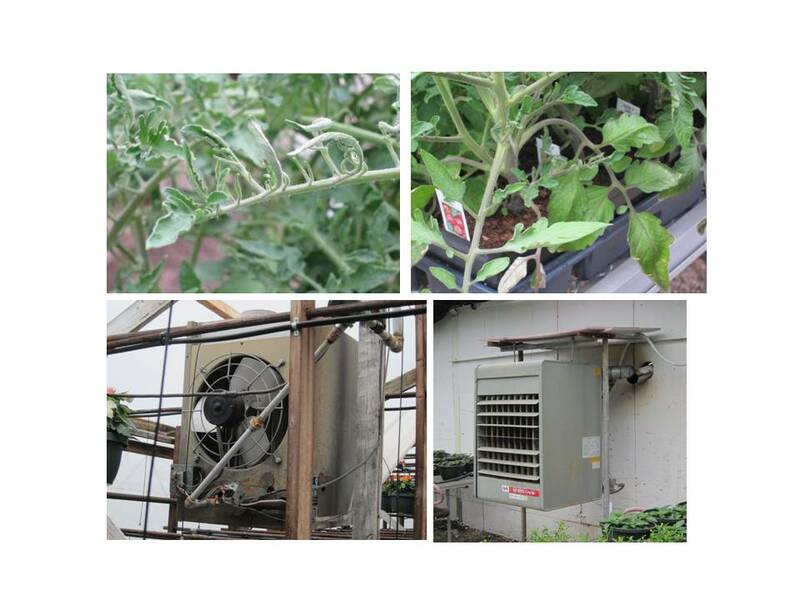 Posted by Beth Scheckelhoff at 10:46am Posted in Greenhouse Management and tagged epinasty, ethylene, ventilation. Bookmark the permalink.